I do love a good list! This marathon checklist is dedicated to my husband, Javier, who is running his first full marathon in San Francisco this weekend. This post contains three lists: what to pack for the marathon, a checklist for the night before the marathon, and a checklist for race morning. Javier likes to use the term marathon to describe “any long or arduous task.” For example, upon returning from a particularly difficult work travel week, he might say: “Man, I’m exhausted… that was a marathon of meetings.” You can imagine how this could be fairly annoying to someone who actually runs marathons. I have informed that he is not entitled to use the word marathon in this fashion until he has, well, run a damn marathon! 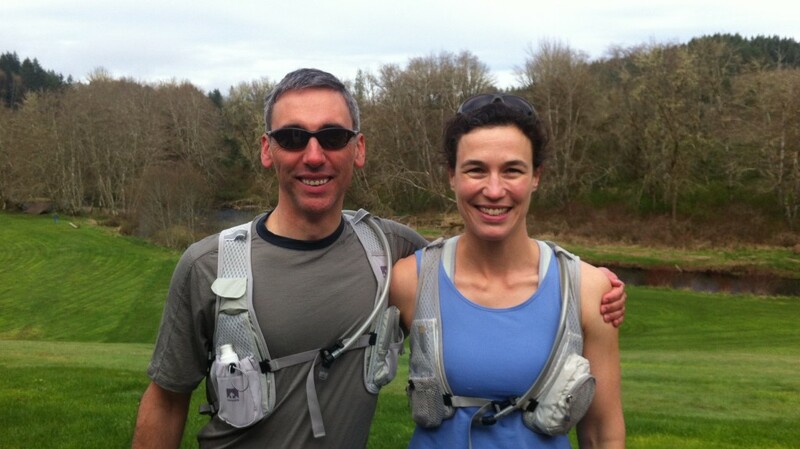 Javier & me before the start of his first half marathon in Vernonia, Oregon (April 2012). In less than 48 hours, I dare say he will be entitled to annoy me with abuse of the word marathon anytime he likes. Here’s to you, sweetie! 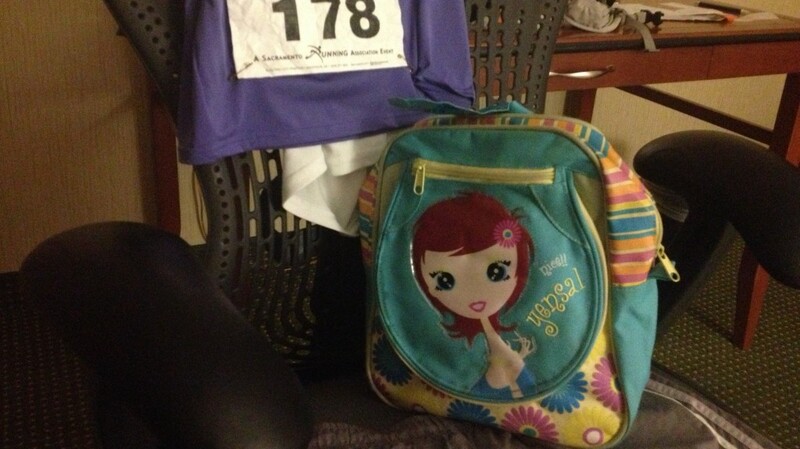 Bib & chip – Write your name and emergency info on the back of your bib. Pin your bib to your race shirt. Use lucky golden safety pins if you have them! Secure timing chip to shoe if necessary. Drop bag – warm and fresh clothes, special food or recovery fuel. This is especially important if you will be on a bus or otherwise have a commute back to your lodging. Relax and/or get psyched by reviewing the race course and double-check your morning schedule. Set alarm(s) – On your phone, on the hotel clock, and/or call for a wake-up call. Take a sleep aid – only if this is something you have practiced and know how you will react. By the way, you should have clipped your toe nails earlier in the week. It’s a shame if you didn’t, but try to avoid doing it the night before the race. Eat breakfast / drink coffee or tea – whatever your personal plan calls for. Apply sunscreen – obviously not applicable to SF Marathon! Lubricate – use Body Glide or your lubricant of choice. Sunglasses & cap – it’s easy to forget these items when leaving a hotel room in the dark. GPS watch – and heart rate monitor, or any other such gadgets. Extra clothes layer – this may be disposable clothes to leave at the start OR clothes you want to keep that you put in your drop-bag for safe keeping and pick-up after the race. I discovered Sportlegs at the TRT two years ago. I believe they work, which, in turn, makes them work for me! I take 3 capsules an hour before a race. I sometimes use them for hard training runs, too. You can take them after a run, but I fell that a good dose of Calcium-Magnesium works just as well post-run (and is much, much cheaper). I like yr checklists. I make checklists for each trip we go on and save them in my dropbox all with the word “packwood” in the file name (for some unknown reason) and then I can access them before any new trip. Lists for backpacking, different races, overnight at our cabin, etc. are all readily available. It helps. Thanks! I’m definitely a list-freak.